So this week my blog will be seven years old. Seven years! It took Lin-Manuel Miranda that long to write Hamilton! Anyway, blogging has changed a LOT in seven years. And, God, I've changed a lot in seven years! 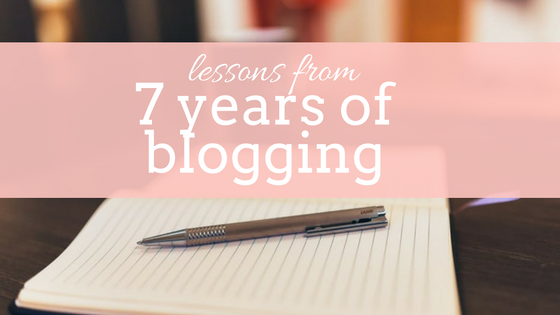 When I first starting blogging in 2009, blogging was just becoming a "thing". I knew maybe one person in real life who had a blog, now I feel like I know a few dozen people who do! And in 7 years I've learned a lot. I've been afforded a lot of amazing opportunities because of this blog. I honestly believe blogging helped me to realise I wanted to work in marketing, and I have referenced my blog in every job interview I've had since university. And I've made a lot of mistakes. Of course I have! I am in no way a "top blogger", and nor have I ever wanted to be, but I love my blog, I'm happy with what I've achieved and I'm proud that I've kept it going for seven years! When I started blogging I had absolutely no idea what I was doing. I didn't have a "niche" (more on this later), I didn't have a plan, I didn't even have a good camera. But I started. And for weeks and weeks the only person who read my blog was my Dad (seriously, I remember sitting looking at my stats back in 2010 and wondering why I had two hits and who the other person was!). Like anything in life, it's easy to think, "I'll start when I've done this, or when I've bought this, or I've got a better idea about that" but the best thing you can do is just get started. I find even now once you start it's hard to stop! I admit, back in 2009 there weren't a lot of bloggers who weren't tall and skinny and blonde, but that ship has definitely, definitely sailed. And thank god! You don't have to "find your niche"
This is the biggest piece of advice I can give. The beautiful but personality-devoid blogger used to be a common theme in 2009 but I think it is becoming less common now. For me personally, I much prefer a blogger who isn't primed and polished and perfect. I love bloggers that are honest, open and more than anything else, and are just...themselves. Of course, not everyone will like you, and that's okay! Following on from my last point. We all know those people on social media who only show their best bits - their perfect makeup, perfect relationship, perfect food, perfect home, perfect friends, perfect job... I just don't think this works in blogging anymore! We need some honesty and reality, and we need to know that we're not alone if we feel like we have no idea what we're doing! I would much rather read a blog where someone is honest about their mistakes, their failures and their struggles rather than a magazine-perfect fake reality. One of the hardest posts I've ever written was my post back in July when I opened up about my struggles with Generalised Anxiety Disorder. Pressing Publish was terrifying. But in the few days after I posted it, I received dozens of emails, messages, tweets and comments from other people who were so grateful that I'd been honest about my struggles and were so glad they weren't alone. And I'm so so glad I wrote that post. We connect with honesty, we connect with vulnerability. Be open, share your stories, connect with your audience. And speaking of honesty, be careful but not too careful when you write. When I published that post, I could have panicked thinking about putting that into the public domain. I could have thought about my boss reading it, or my family or Phil's family, or people I went to school with, or people who might use my anxiety against me. But I didn't. And if I let myself think about all the people who might be reading my blog it would drive me insane. On the flip side, don't blog anything with your name on it you wouldn't feel comfortable talking about publicly. Levels of comfort vary for everyone, but there's a difference between being nervous about publishing because you're opening yourself up, and being nervous because you know what you're writing may come back to haunt you. I've made this mistake loads of times and it's just a lesson that only experience can teach you. This is one I've really learned this year. I was finding myself increasingly frustrated with my blog because I was feeling really disconnected with "fashion bloggers" - I didn't identify with them anymore, I didn't even read fashion blogs anymore, yet I was still writing a blog which focused on outfit posts. So I stopped. I started writing posts more like the posts I liked to read, not just writing a certain kind of post because that's what I'd been doing for 6 years. And I've been so much happier with my blog since then. For a long time this blog was a "fashion blog", hence the name. But then it became a fashion blog with some fitness thrown in. Then a fashion blog with fitness and food thrown in. And now it's a bit of everything. I write whatever I want to write and hope that if I want to write something my readers would like to read it too. And I'm so much happier now I'm not pigeonholed and don't have a so-called niche. Write what you know, write what you're interested in and your passion will shine through. I work in marketing as a content marketer, so this is the exact opposite of what I do all day at work, but when it comes to my personal blog, I write what I want to write. I don't pore over my stats to determine the kind of content that does best, I just write what I want to write. Of course, that might be why I'll never "make it big" but that's never been my goal anyway. edit: This is probably terrible advice if you actually want to blog professionally, but in terms of things I've personally learned, this is my lesson. You probably won't "make it big"
I honestly think the blogging bubble has burst. Six, seven years ago there was every chance you could "make it big" bit now I think the market is just too saturated. But "making it big" or "free stuff" should never be your goal. I have never wanted to be a full-time blogger. Okay maybe for a brief period when I was about 20. But full-time isn't everyone's goal, despite the hundreds of articles on how to get there. I love my career, I love my job and my blog is just fun. And that's okay! But if you want to blog full time, that's fine too, but it's not everyone's goal. Ah this might just be a me-thing, but I always feel that if you want to blog you should be able to write well. I'll read anything if it's well-written. There are a lot of blogs out there that aren't well-written, and I personally use blogging as a chance to write because I love to write. But saying that there are loads of successful blogs that I think are terribly written, so what do I know, hey? I have softened on this slightly in the last few years and written a lot more short blog posts, whereas I used to only write blog posts if I really had something to say, but I would still rather write, and read, a blog updated infrequently with great content that all the time with fluff. Like anything in life, if you work hard you'll do well. If you don't, you won't. Easy. In blogging and if life. Someone, hell, loads of people, are going to be better than you. Just do your thing and focus on you (see: be yourself) and please try not to compare! I've had breaks from this blog for weeks at time, and other times I've not been able to get the ideas out of my head fast enough! I find creativity comes and goes, but I always have a notebook with me to jot any ideas down on the go (or they go in my phone in an emergency!). Everyone gets writers' block. Take a break and come back later - don't force it. Forced sponsored posts are a real pet hate of mine. It's one of the reasons I don't really do paid sponsored content now and only accept a few product reviews. It gets too easy for your blog to feel like one big ad, for everything to feel forced and for you to lose authenticity. Sponsored posts can be great, but ensure they fit with your style, audience and tone. In a lot of blogging genres, it can be easy to just buy "stuff" to create content - fashion, makeup, interiors etc. But that really isn't what blogging is! Michelle wrote a brilliant post on this which puts it much better than I can! When I started this blog I could just about work a point-and-shoot and I could make livejournal icons in Photoshop, and that was about it. Now I know a bit of photography (I took night courses a few years ago), some HTML, some Photoshop. Not lots, but way more than I did. A lot of blogging is about figuring things out as you go, which is a great way to learn new skills! I don't comment on blogs anywhere near as much as I used to (I don't really comment on blogs at all now!) but I have lots of friends I've made throughout blogging and I'm in constant communication with them on Twitter and Instagram. Tweet bloggers if you loved their post, join in the conversation, find new blogs and engage with bloggers. There's a great little community out there! I've lost count of the number of times I've run into someone from school/uni/an old job, or got a random Facebook message from an old friend and they tell me they read my blog! Often people I haven't spoken to for years! I've always, always shared my blog on Facebook and Twitter and these are the places I get most of my traffic from. So share your posts - don't be shy! Like anything you're passionate about, people will laugh at you. But blogging is an amazing thing to do in your spare time. Like I've detailed here, it teaches you so many skills, helps you develop your writing and creativity skills plus you're actually building something new, and that's an awesome thing to do! Haters gonna hate! When I first started this blog I wanted to be a journalist. I'd started writing for the student newspaper at uni (University of Birmingham Redbrick represent!) and met a girl who was a blogger and realised that woah, I could just start a blog. And a few years later, instead of going into journalism, I realised that I'd already made a pretty good start at being a marketer. I was writing content, I was promoting it, I was engaging with an audience, I was using social media, I was understanding analytics, I was creating graphics. It was a no-brainer. I have my blog on my CV and on my LinkedIn, and I've talked about it in every single job interview I've had and it's never failed to impress. Who would have known that back in 2009 eh? I'm really proud of this blog, and while I think of 2011-2012 as my "blogging heyday", I think that was more from a fashion blogging perspective. Actually, I think I've written some of my best posts this year, and I'm really excited about the direction my blog is going in. I'm constantly grabbing a notebook to write down ideas and I have posts bubbling around in my head all the time. I'm excited to see what 2017 brings! And who knows, maybe I've got another 7 years in me yet!